An old college buddy follows The Trad and he called me up last week with a question. "I haven't worn a suit to work in 10 years. But sometimes I meet a client and I wanna show some deference. Not enough to make him uncomfortable but enough to show I made an effort. You know?" There's been a ton written about 'Casual Friday' since the early '90s, but not much about how to make a low key impression. The mistake is to break out the chalk stripe suit, seven fold tie and double cuff Royal Swiss cotton shirt. It's all very elegant but it's too much today. Hell, it was probably too much yesterday. There's no reason the understated navy blazer can't be more than the sum of its parts. Basic Training is the center vent, darted, poly wool piece of crap my mother bought for me in high school. It's not meant to last beyond three or four dry cleanings when the glue holding it together melts and puckers. Good for a wedding, a couple funerals and high school graduation pictures. Cheap, right as rain and discreet. And still available it appears. 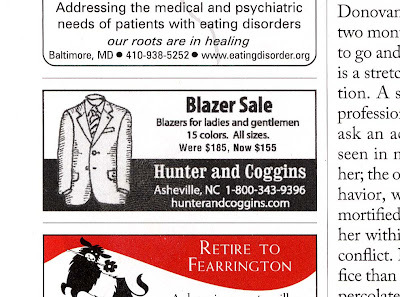 This ad for Hunter & Coggins ran in the recent New Yorker touting $155 blazers. If you need something you can throw on the back seat of your car, and replace cheaply because of too many client lunches-- then this baby is for you. It even comes in a bizarre array of colors to suit junior high school coaches throughout the southeast. I've warned you off the maroon. In fact, I would advise there's only navy and hunter green, but you do what you want. It's your $155. Way the hell over on the other side of the blazer tracks lives cashmere. She's warm in the winter but cool enough for summer. No one will pay her any attention until the client slaps you on the shoulder or she touches your sleeve. 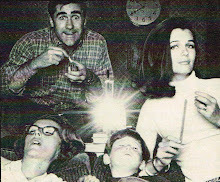 You'll see the change in their face as they leave their hand on the goods for another moment. Finally, as they take their filthy mitts off you they'll say, "What is that? It's so, so, sofffttt." And you say, "It's cashmere..." drawing out the 'mere' while you blush with humility. Either way, your client will be glad he's doing business with you. You're not making enough to afford anything but a $155 blazer-- or-- because you were discreet and humble enough to wear the very best and not bang a drum about it. Although, you may have troubles increasing your fee. If that's the case, tell him you got it on sale at J Press. He won't know who that is, but if he has half a brain he'll google J Press after you leave and order one for himself. The feel of quality is the reason we live for this stuff, isn't it! "Dallas and Mainline are officially uninvited to the hunting lodge at my parents place just off the Lolo trail in Idaho." Boo hoo. chat board hunting stories are sweet, ask your dad about the beaver i shot in that same hot tub. 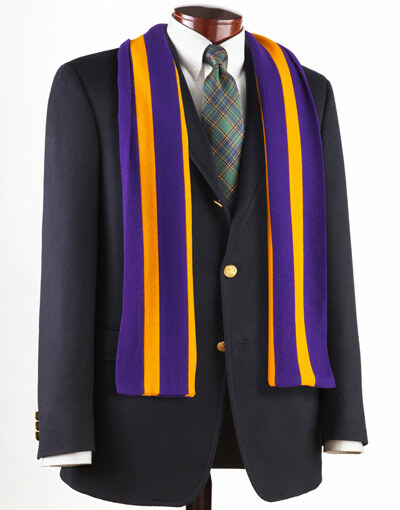 I recently found a double breasted blue, three rows up of buttons, not two, and plain blue buttons- they don't trumpet like the brass ones and man it wraps me in nice... the label, "Custom tailored, the A.Nash Co. Cincinatti" another bygone... whats that crazy scarf- Minnesota Vikings?